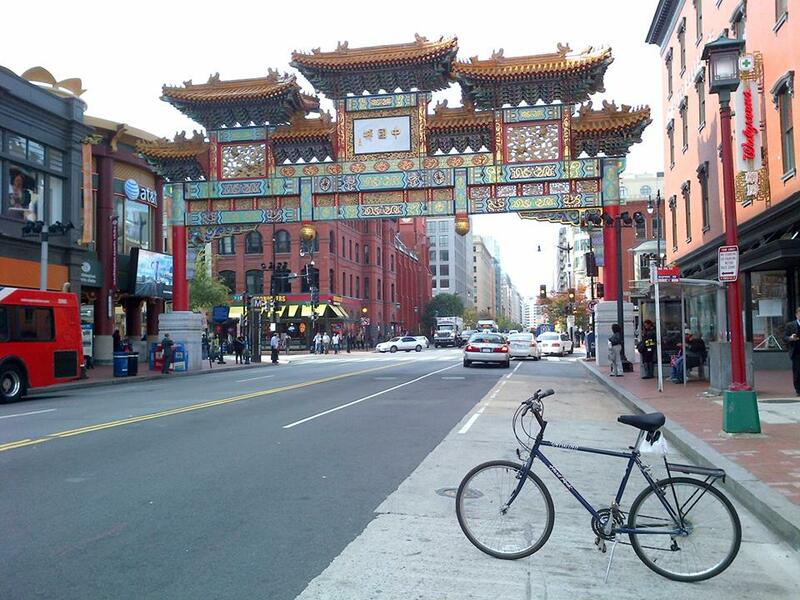 My traditional end-of-the-month restaurant review for this last full month of summer is of the family-owned Tai Shan Chinese Restaurant, located at 622 H Street (MAP), just down the street from the iconic Friendship Archway in the heart of northwest D.C.’s Chinatown neighborhood. The first time I visited Tai Shan was memorable. Interestingly, however, it was not because of the food. It was on August 23, 2011. 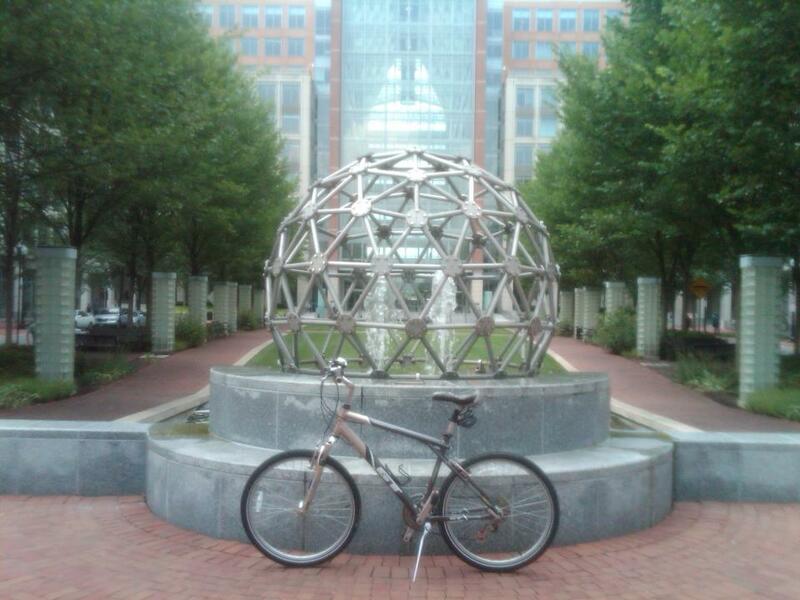 I can remember the date because I stopped in on my way back to my downtown office after a long bike ride on the Metropolitan Branch Trail. And as I rode through Chinatown, I could see that traffic in the streets was gridlocked, and the sidewalks were overcrowded with people who had evacuated the nearby buildings. 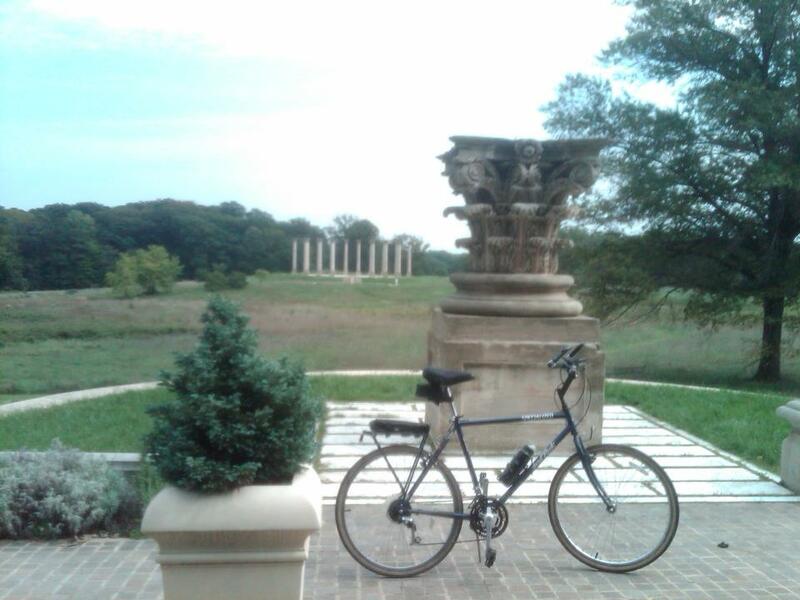 I had been alone and somewhat isolated from the city while I was riding on the trail, and based on what I was seeing I was fearful that there had been another terrorist attack. I went into the restaurant and asked what was happening, and it was then that I found out that there had been an earthquake. I had not felt it, and did not know about it until that moment. They were still open for business, so I got my order to go and ate my lunch that day across the street from the building where I work while I waited for engineers to inspect the building. A couple of hours later we were advised by security personnel that we could enter the building only long enough to gather our belongings, and to drive our cars out of the basement parking garage if we were parked there. Although a number of buildings and structures in the city suffered significant damage, such as The Washington Monument and the National Cathedral, our building was deemed safe and we were able to return to work the next day. I have been back to Tai Shan a number of times since that initial visit, and despite an expansive menu specializing in authentic traditional favorites as well as specialty entrees, my customary order is the orange chicken with steamed rice. In fact, I’ve been back so many times that several of the servers there recognize me and ask me if I’ll need a menu or will I be ordering the orange chicken again. I have tried numerous of their other offerings as well, and based on the dishes I have sampled, combined with the inexpensive prices, I can understand why Tai Shan has been awarded several Washingtonian Best Bargain Restaurant awards. A stalwart among Chinatown’s more than twenty Chinese and Asian restaurants; Tai Shan’s informal atmosphere reflects the traditional culture of the neighborhood. Simply furnished and decorated, the décor consists of solid wooden tables and chairs with an Asian flair, pastel floral tablecloths, festive and colorful lighting, and traditional Chinese lanterns. Although somewhat small in size, it is still roomy. And a wall-length mirror on one side of the dining room helps provide an illusion of extra space. Tai Shan’s name is Mandarin for “peaceful mountain,” and the quiet and comfortable setting, which provides a respite from the hectic city just outside its doors, helps it live up to its name. 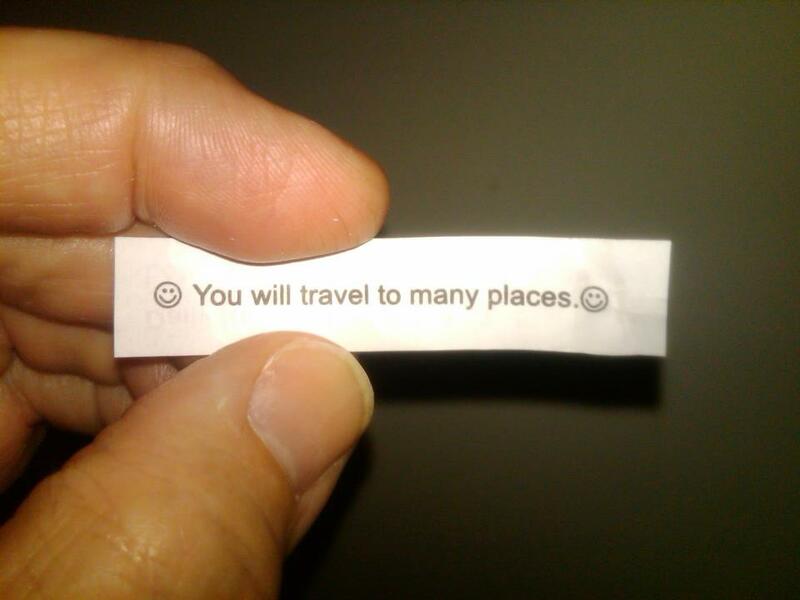 The fortune from a fortune cookie I got recently with my lunch read, “You will travel to many places.” I thought this was very applicable to me, and I interpreted it to apply to my adventures travelling by bike in D.C. When travelling to Tai Shan, you should know that they provide no parking, and nearby street parking is very limited. 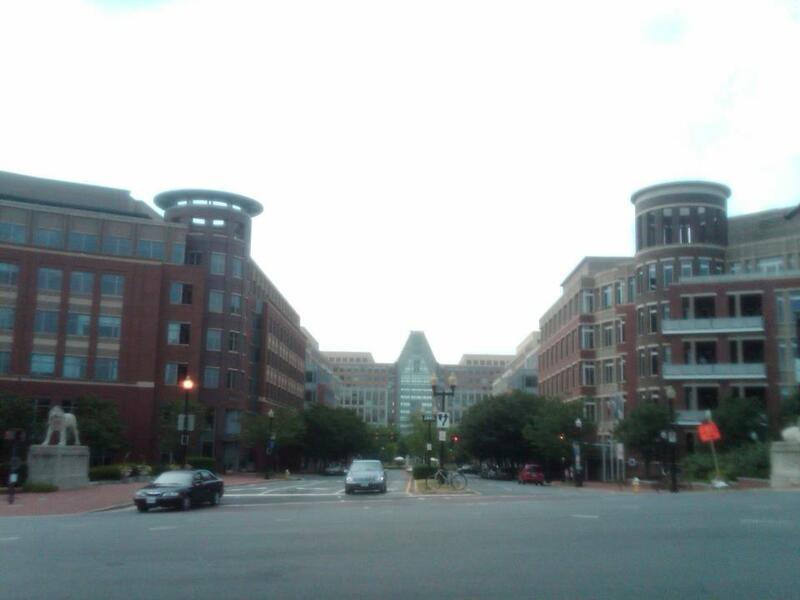 But it is easily accessible by Metro, with the Gallery Place/Chinatown Metro Station just a half a block down the street. 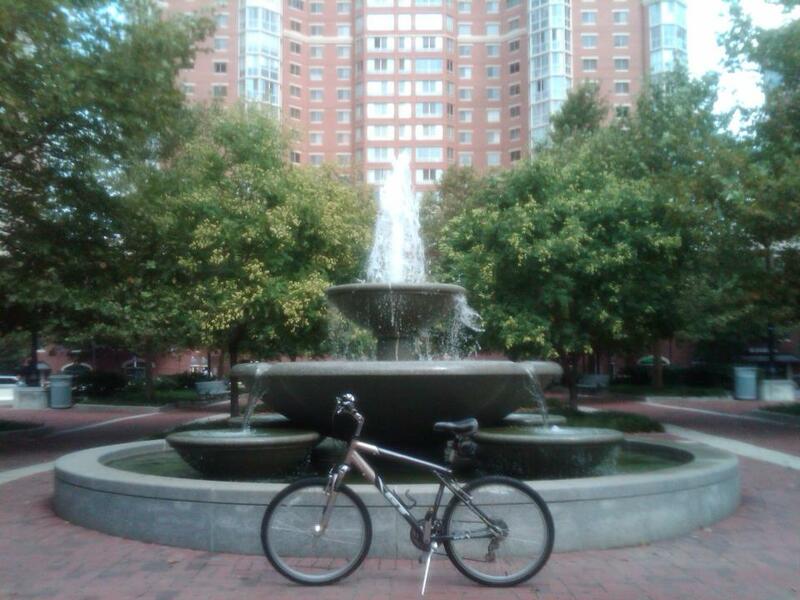 Or you can do as I always do, and put transportation worries aside and go there via bicycle. 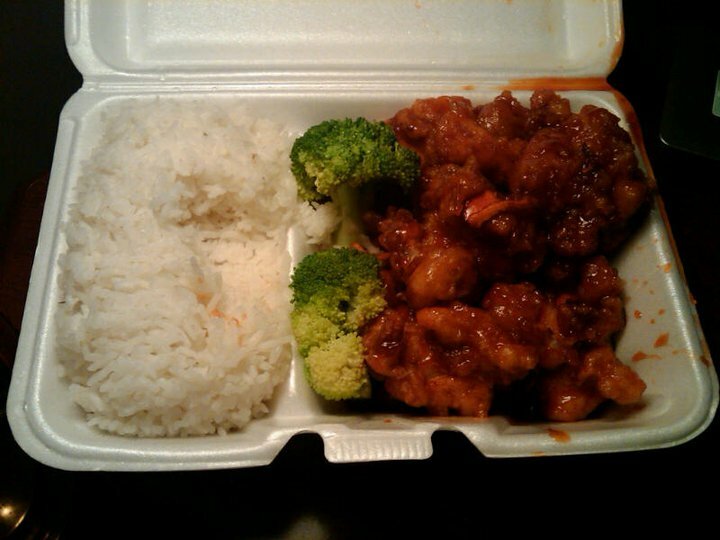 The Chinatown restaurant is sometimes known as D.C.’s other Tai Shan, because Tai Shan is also the name of a famous panda cub who was formerly a resident across town at the National Zoo. While the panda was universally liked, the restaurant has received mixed online reviews on such sites as Yelp, Urbanspoon and Foursquare. Nonetheless, I have always found Tai Shan to have quality food, generous portions, fair prices, and fast and friendly service. So I recommend Tai Shan. But perhaps you should go and decide for yourself. 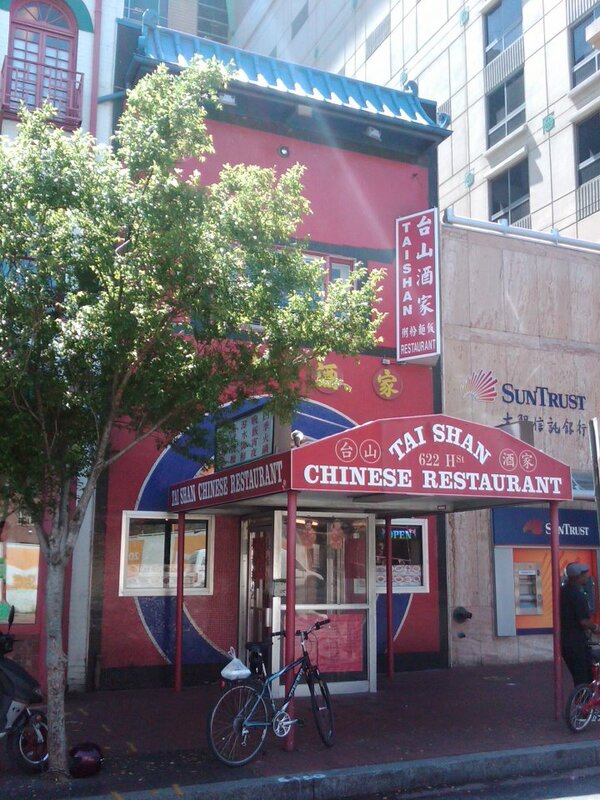 UPDATE: After operating for 21 years at its H Street location in Chinatown, Tai Shan closed its doors in August of 2015. 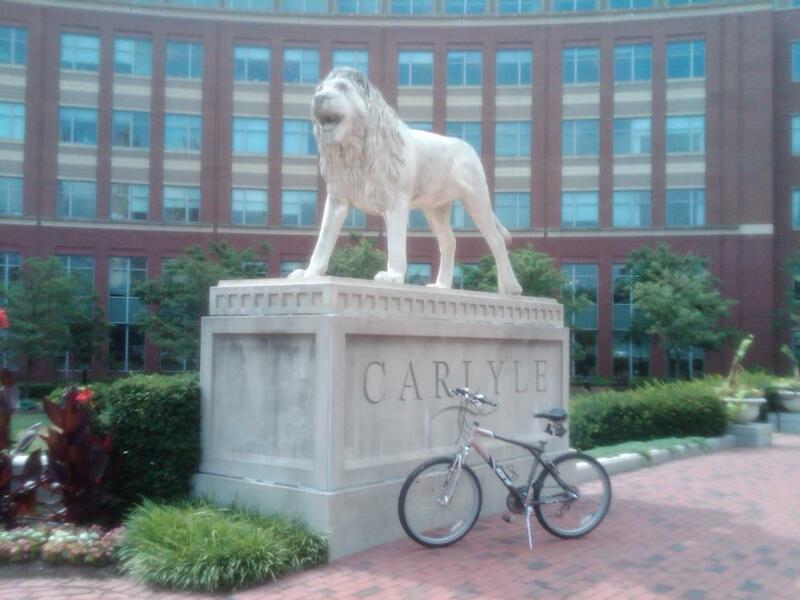 On this bike ride I travelled out to the campus of The U.S. Patent and Trademark Office (USPTO), located in nearby Alexandria, Virginia. Bordered by Duke Street to the North, Eisenhower Avenue to the South, John Carlyle Street to the East and Elizabeth Lane to the West, its official address is listed as 600 Dulany Street (MAP). 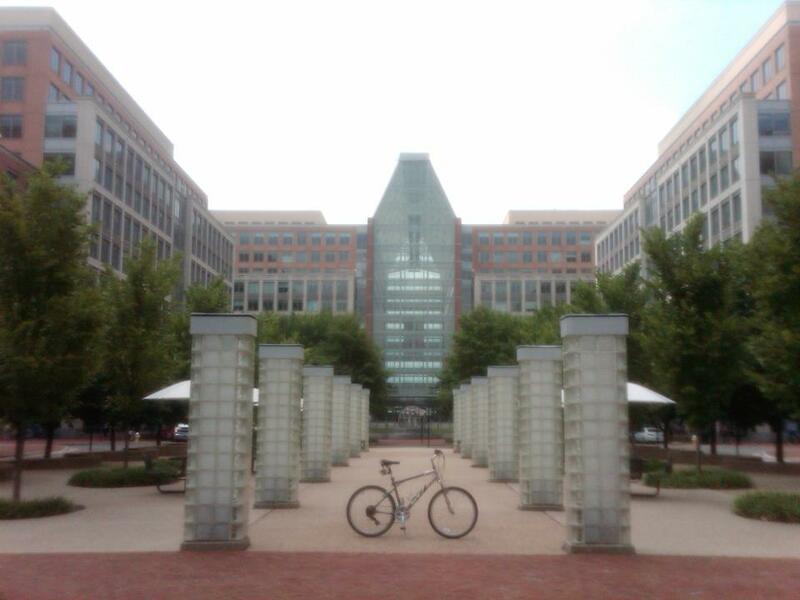 Developed in 2006 to consolidate employees and resources from the dozen and a half different buildings it had been occupying, the USPTO main campus is comprised of eleven buildings. The modern, city-like development is anchored by the East and West Madison Buildings, and surrounded by ground floor retail and high-rise residential buildings. 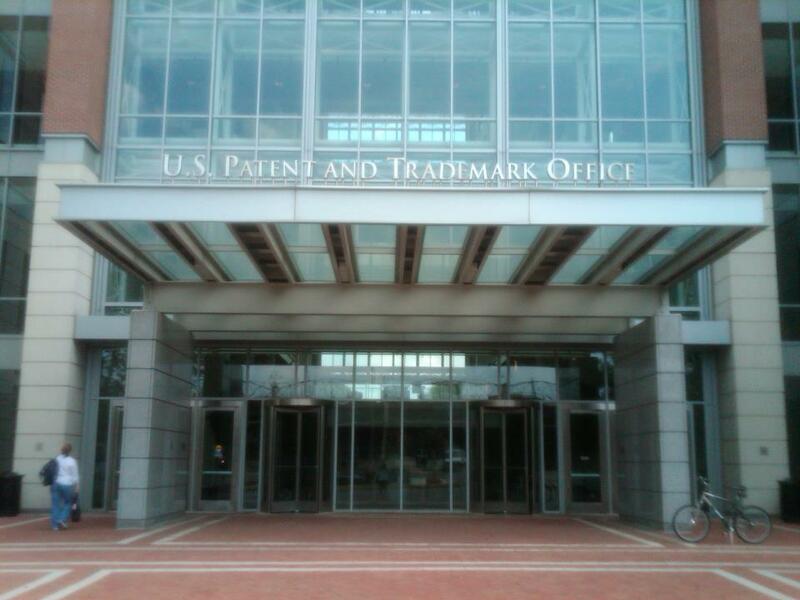 The USPTO is an agency withini the Department of Commerce that issues patents to inventors and businesses for their inventions, and trademark registration for product and intellectual property identification. Patents and trademarks, as well as copyrights, are all distinctly different issues legally. A patent is granted for an invention, process, device or method that is deemed both new and useful. 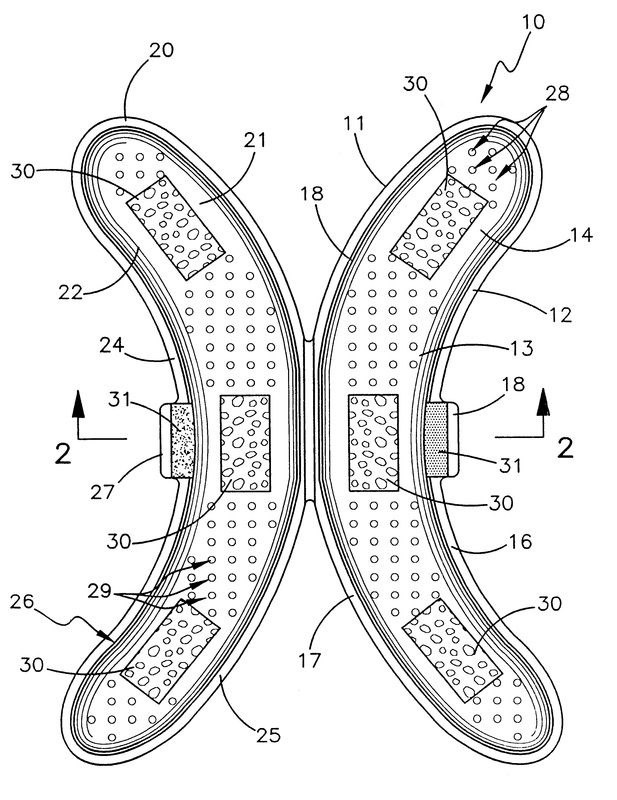 The patent guards the product from being able to be legally copied by others. Trademarks protect slogans, phrases and trade names. And copyrights pertain to original expressions, ideas, books, videos and films, photographs or other original works. Copyrights are granted by the U.S. Copyright Office, which is a department of The Library of Congress. 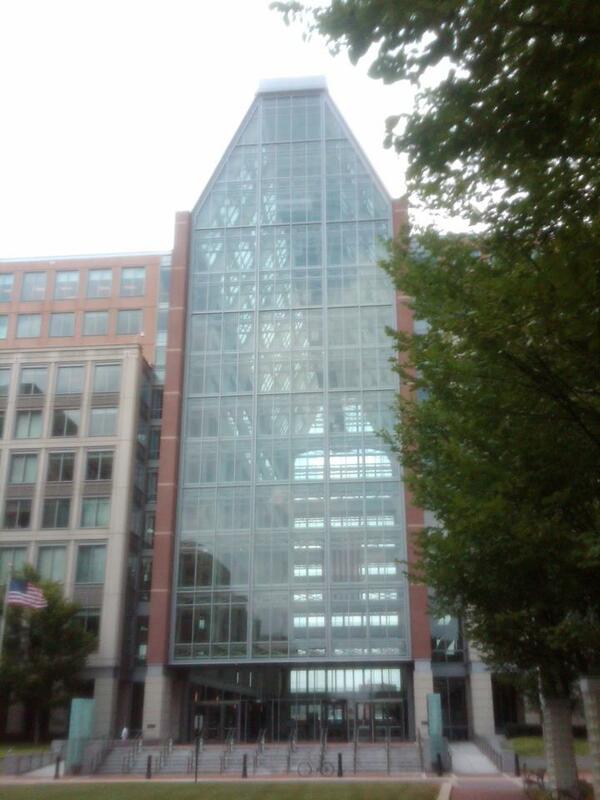 The USPTO is unique among Federal agencies because it the only one that does not receive any money from the American taxpayer. Instead, the USPTO operates like a business and receives all of its funding from its users by charging fees projected to cover the costs of performing the services it provides. This is possible because although the application, legal and other costs involved in the 13-step patent submission process may be high, the value of a patent once it’s obtained can often be much higher. A recent study by the Brookings Institute determined that the average patent is worth over $500,000, and even single patents from relatively unknown companies can sometimes sell for a millions of dollars. However, despite the costs of obtaining a patent and its value once obtained, approximately 16 percent of patents are allowed to expire after just four years because the owners refuse to pay a relatively nominal maintenance fee. In addition to being potentially costly, obtaining a patent can also be a drawn out, time-consuming process as well. The latest statistical figures available indicate that there are well over a million applications currently pending with the USPTO, and over a thousand more are added to the backlog every day. The result is that it now takes an average of two to three years for an applicant to secure a patent. While it’s true that the patent system has encouraged genius and innovation, it has also resulted in patents for a number of inane and impractical inventions as well. One example is a patent for a “Banana Suitcase” (U.S. Patent No. 6612440), which was issued in 2003 for a protective device for storing and transporting a banana. 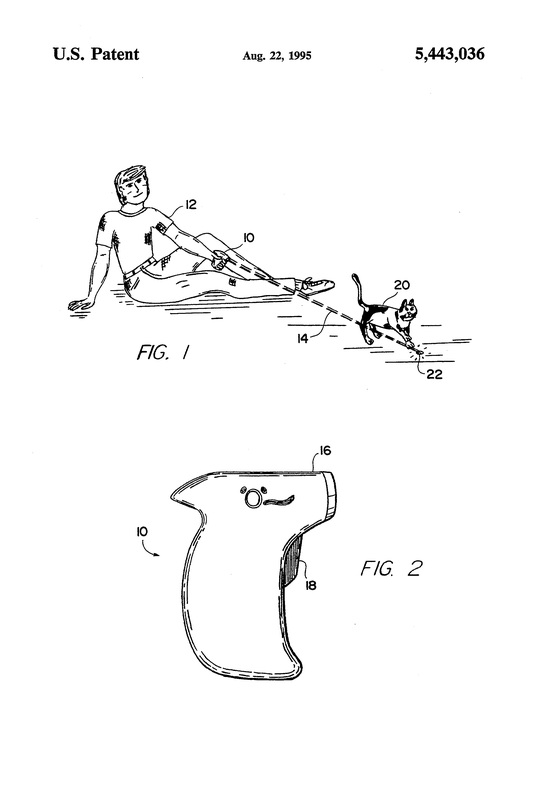 Another example of an absurd patent issued by the USPTO is a patent granted in 1995 for a “Method of exercising a cat” (U.S. Patent No. 5,443,036), which covers having a cat chase the dot created by the beam of light from a laser pointer. 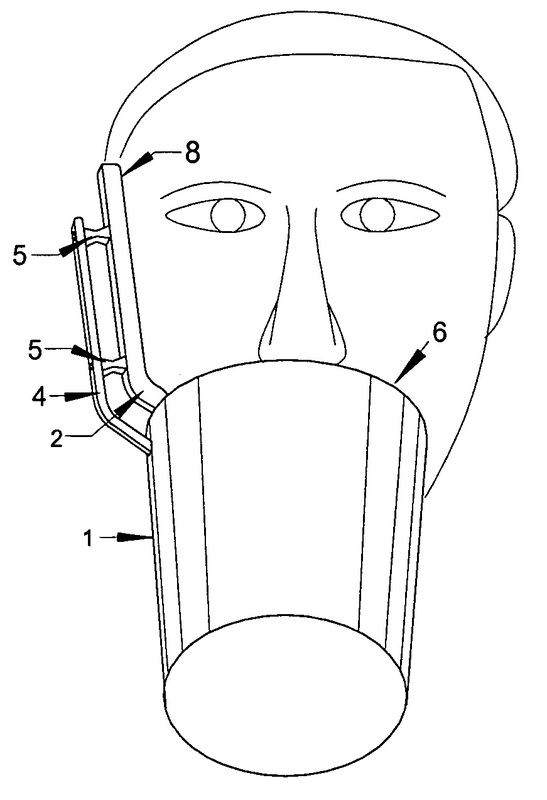 Yet another example would be a patent for a “Hiccup Treatment” (U.S. Patent No. 7062320), which was issued in 2003 for a device made to shock the hiccups out of a person with a friendly jolt of electricity. 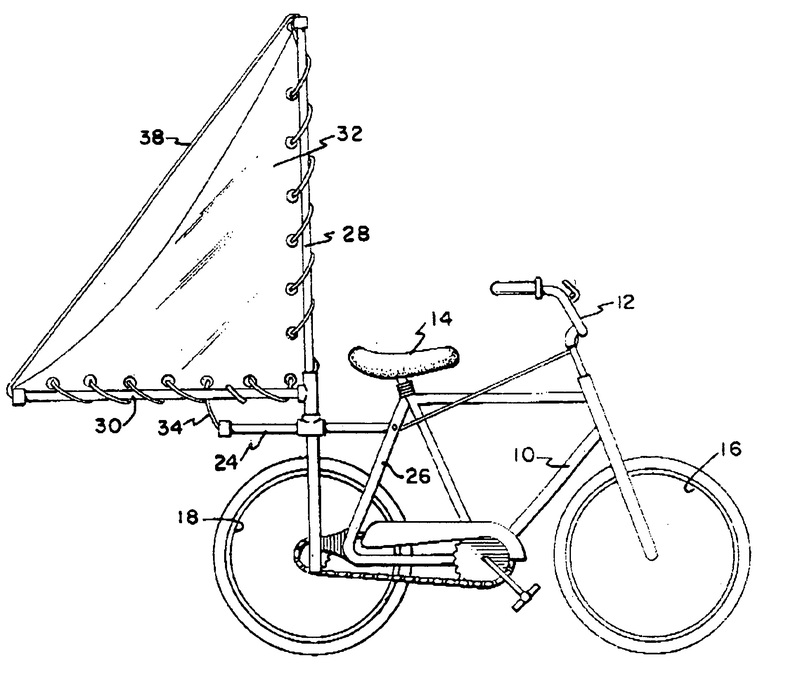 A patent was also issued in 2005 for a “Wind-Harnessing Bike” (U.S. Patent No. 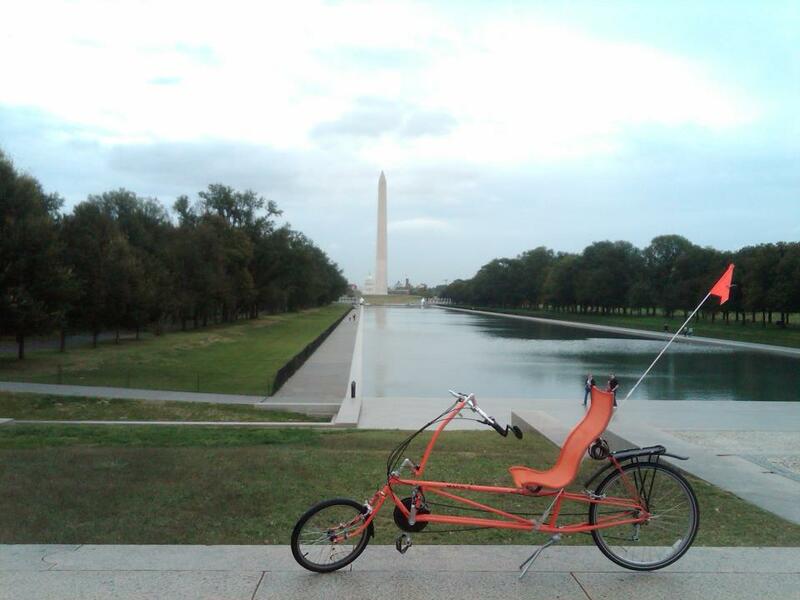 6932368), a design in which a sail is adapted to fit on the rear of the bicycle above its rear wheel and is secured to the bicycle seat, which when connected to the bicycle harnesses wind to drive the vehicle and rider forward. Actually, that last one doesn’t sound to me like such a bad idea. If you have an idea for invention that you think is worth patenting, you may want to check first to see if there is already a similar patent. The easiest way to do this is to use Google’s Patent Search. This search engine can also be fun for just browsing and wasting time. 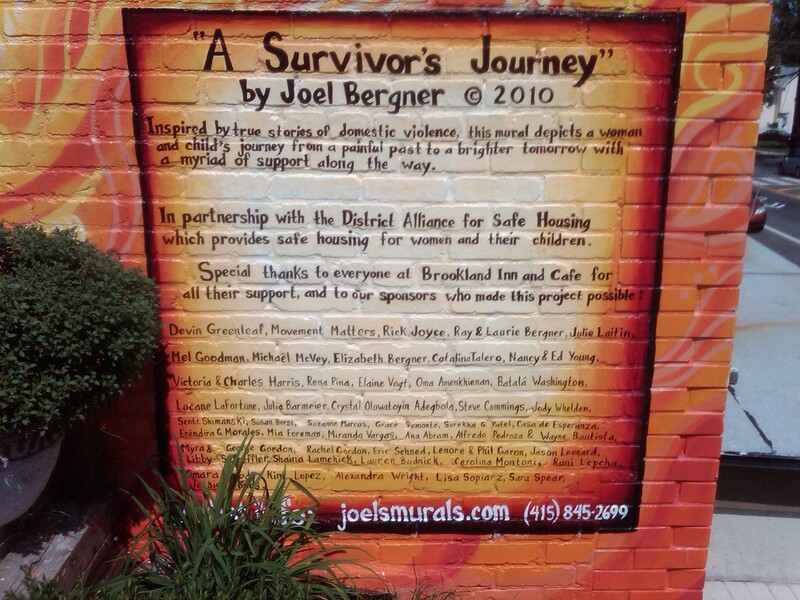 This bike ride took me to the Brookland neighborhood in northeast D.C., where I happened upon a Domestic Violence Awareness Project mural, entitled “A Survivor’s Journey.” The public artwork is located near The Catholic University of America, on the side of The Brookland Café building at 3740 12th Street (MAP), which donated the wall as a canvas for the artwork. 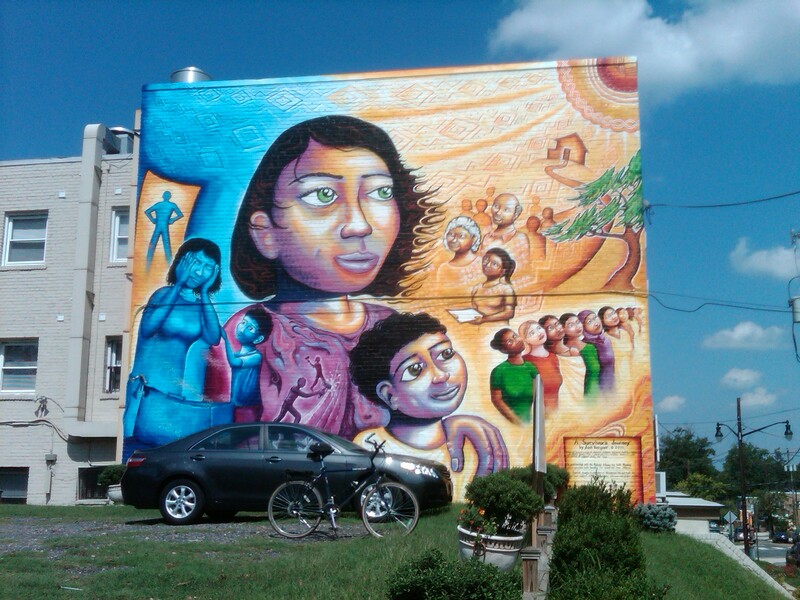 Local award-winning mural artist Joel Bergner, who partnered with the District Alliance for Safe Housing (DASH), an organization that provides refuge and services to victims of domestic abuse, created the large and colorful mural in 2010. The project was financed through fundraisers, and in part by a campaign on Kickstarter, an online fundraising site for all things creative. A Survivor’s Journey generally depicts darkness transitioning into light as it progresses from the left to the right of the piece, with the sun shown in top right corner of the piece. The details of the mural show a collage of images. Among them, an older couple positioned down the road from a home, a woman holding a clipboard, and a group of woman who appear to represent a variety of races and ethnic backgrounds. Another image shows a scene which includes a figure of a controlling man with his hands on his hips standing in a doorway behind a woman, who is painted using only black and blue, possibly representing the bruises and injuries she has sustained as a result of physical abuse. The woman is covering her ears while a child, presumably her son, is looking up at her and tries to console her. 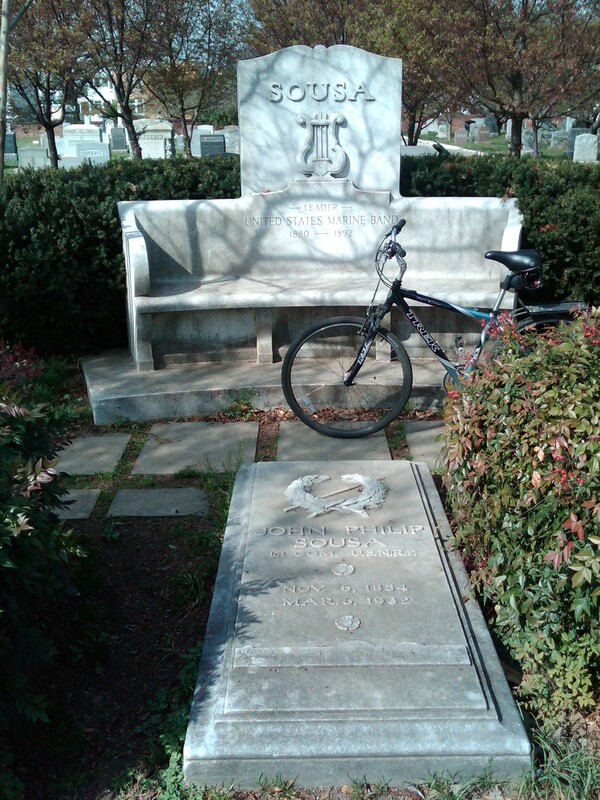 On this bike ride I went by some of the places in D.C. that have a connection to “The American March King”, John Philip Sousa. Because the bandmaster and composer was born in D.C., spent much of his career here, and eventually was buried in D.C., there are many connections between him and the national capitol city. 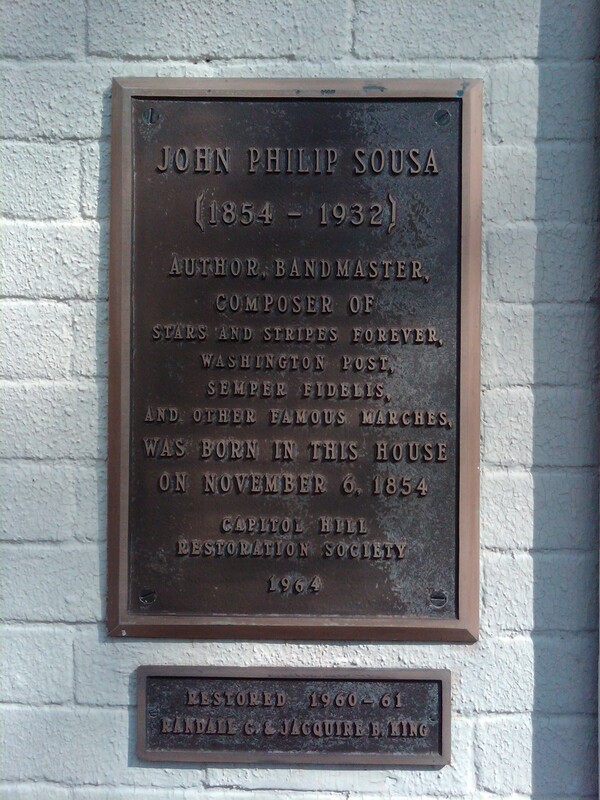 John Philip Sousa was born to Maria Elisabeth Trinkhaus, a Bavarian immigrant, and John Antonio Sousa, a Spanish immigrant of Portuguese descent. 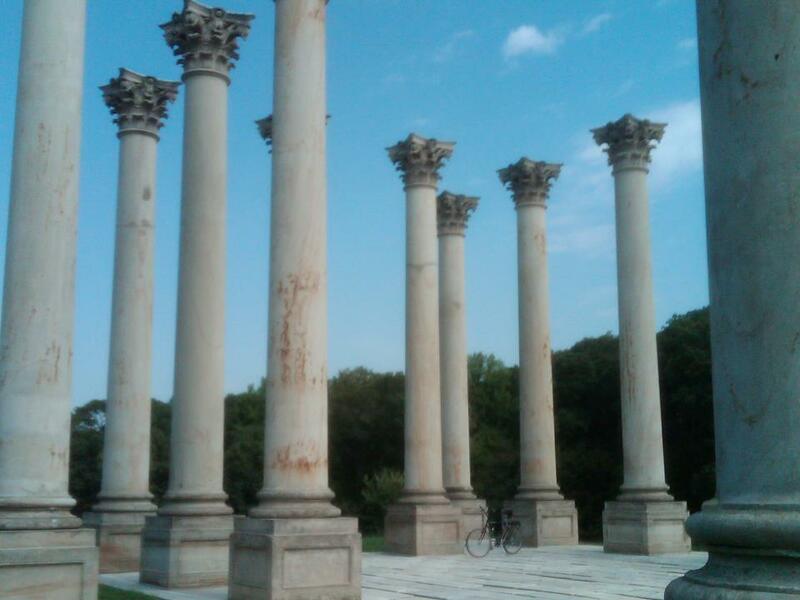 His parents moved to D.C. in 1854 where his father became a trombonist with the U.S. Marine Band. John Philip Sousa was born later that year, on November 6th. At one point in time Sousa aspired to be a baker, but a career in music was almost inevitable. Besides having a father who was a musician, Sousa started his music education by playing the violin as a pupil of John Esputa and George Felix Benkert for harmony and musical composition at the age of six. He was found to have absolute pitch. During his childhood, Sousa studied voice, violin, piano, flute, cornet, baritone horn, trombone and alto horn. His early education and training would serve him well throughout the rest of his life. Sousa was enlisted at the age of 13 by his father as an aprectice in the Marine Corps in order to prevent him from running away and joining a circus band. He stayed in the Marine Corps for seven years, but at the age of 20, Sousa received a special discharge from the Marines and embarked on a career as a professional musician. He toured with two companies and a vaudeville show, worked at two Philadelphia theaters, taught music, composed operettas, and even corrected proofs at a publishing company. In 1879, Sousa conducted Gilbert and Sullivan’s immensely popular H.M.S. Pinafore. Under his masterful orchestration, the amateur company at his command was able to turn professional. Its success led to a season on Broadway where famous composers took in Sousa’s production. Word of the young music director’s accomplishments did not escape the attention of his former employer; and in 1880, the 25-year-old Sousa returned to the U.S. Marine Band when he was named its 14th leader. He remained as its conductor for the next dozen years. Sousa led “The President’s Own” band under five presidents from Rutherford B. Hayes to Benjamin Harrison, and played at two Inaugural Balls, those of James A. Garfield in 1881, and Benjamin Harrison in 1889. He left the Marine Corps again the following year. After leaving the military, Sousa organized and started his own band in 1892 , named The Sousa Band. He and his band spent the next 39 years touring and playing concerts in America and around the world. It was during this time that Sousa composed the vast majority of works in his voluminous musical portfolio, which included 136 marches, such as: “The Washington Post,” for the celebrated newspaper of the same name; “Semper Fidelis”, the official march of the United States Marine Corps, and; “Stars and Stripes Forever”, officially designated by an act of Congress as the national march of the United States. It was also during this period, in 1917, that Sousa became the leader of the U.S. Navy Band and directed concerts to raise money for World War I. The Sousa Band performed at 15,623 concerts, including at the World Exposition in Paris, at which time the Sousa Band marched through the streets to the Arc de Triomphe – one of only eight parades the band marched in over its nearly forty years. Interestingly, Sousa held a very low opinion of the emerging and upstart recording industry. Using an epithet coined by Mark Twain, he derided recordings as “canned” music. In fact, Sousa’s antipathy to recording was so strong that he almost never conducted his band when it was being recorded. For the first stop on my bike ride I went by the house, located at 636 G Street (MAP), in the Capitol Hill neighborhood of Southeast D.C., where Sousa was born. Over the years the house has gone through a number of private owners. It was most recently purchased in 2008 by Gunnery Sergeant Regino Madrid, a violinist with “The President’s Own.” Founded in 1798 by an Act of Congress, “The President’s Own” United States Marine Band is America’s oldest continuously active professional musical organization. Today, “The President’s Own” is celebrated for its role at The White House and its dynamic public performances. “The President’s Own” encompasses the United States Marine Band, Marine Chamber Orchestra, and Marine Chamber Ensembles, and performs regularly at the White House and at more than 500 public performances across the nation each year. 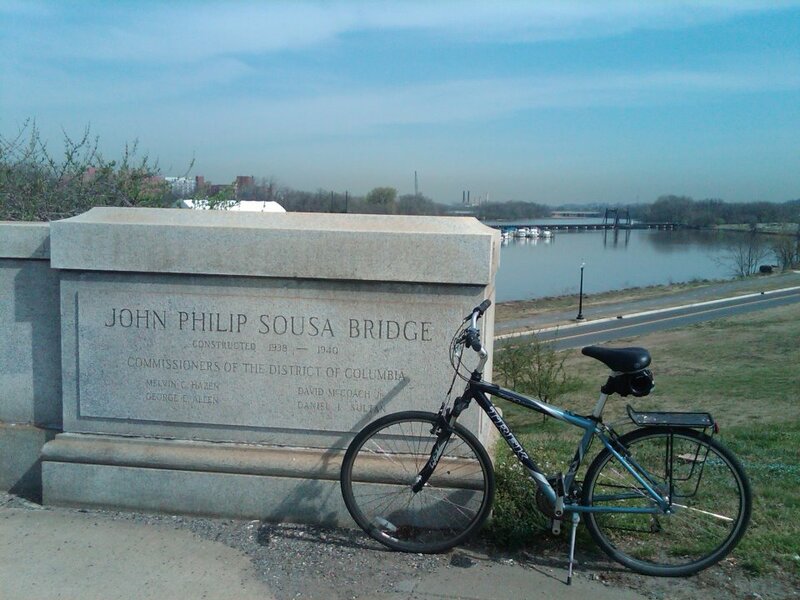 On this bike ride I also road over and back across The John Philip Sousa Bridge, which carries Pennsylvania Avenue across the Anacostia River in Southeast D.C. (MAP). It has partial interchanges with unsigned Interstate 695 at its western terminus and with District of Columbia Route 295 at its eastern terminus. The first bridge at that location was built in 1804. Later, it was replaced by an iron, underslung truss bridge on masonry piers which was built between 1887 and 1890. The same masonry piers were used in the construction of the present bridge, which was named after Sousa in 1939, and completed in 1940. 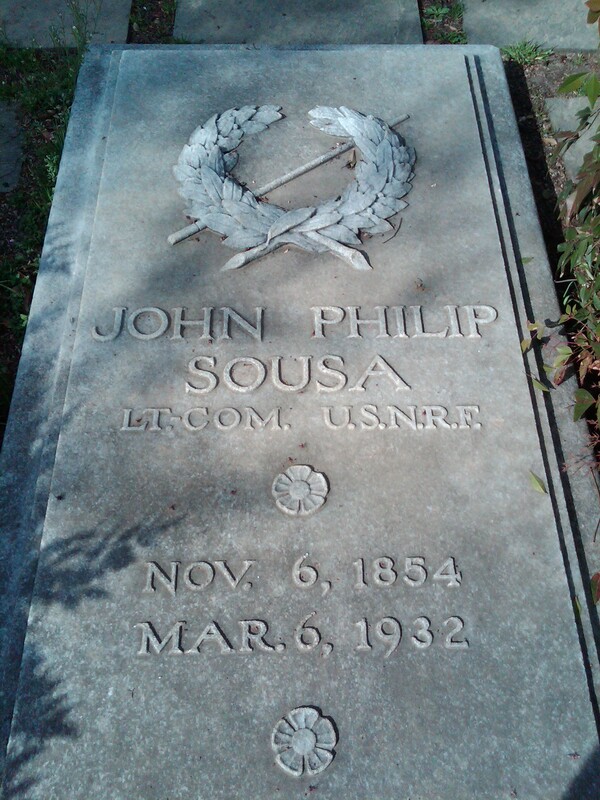 Lastly, I stopped by Sousa’s final resting place at Historic Congressional Cemetery, located at 1801 E Street (MAP), which is also in the Capitol Hill neighborhood of Southeast D.C. Sousa’s gravestone is inscribed with a fragmant of his greatest march, “Stars and Stripes Forever”, and is located within a family plot that includes graves for his wife and three children. Although he lived a full life and had enjoyed an incredibly successful career that took him all over the world, his gravesite is located within sight of the bridge named in his honor, and just a mere mile away from the house where he was born. 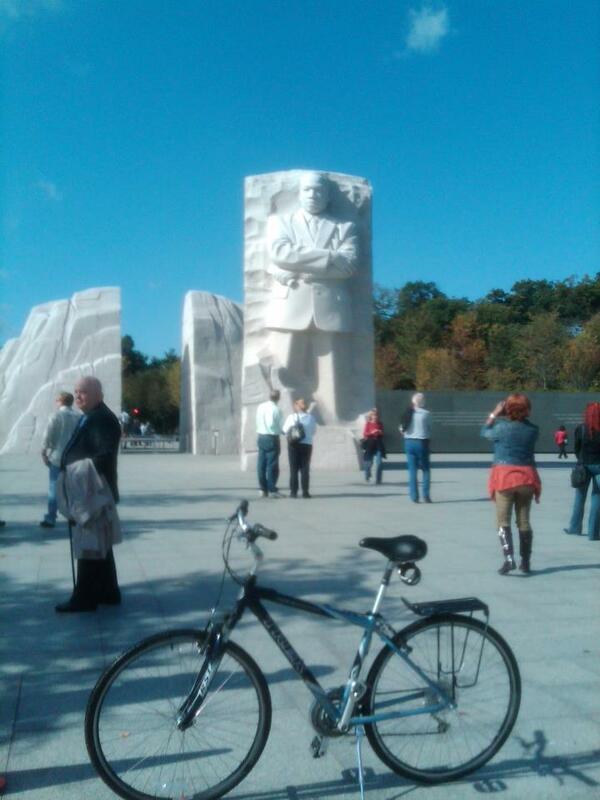 One of the most recently dedicated of D.C.’s major national memorials is the Martin Luther King, Jr. Memorial, and that was the destination of this bike ride. The memorial opened to the public three years ago today, on August 22, 2011, after more than two decades of planning, fund-raising and construction. 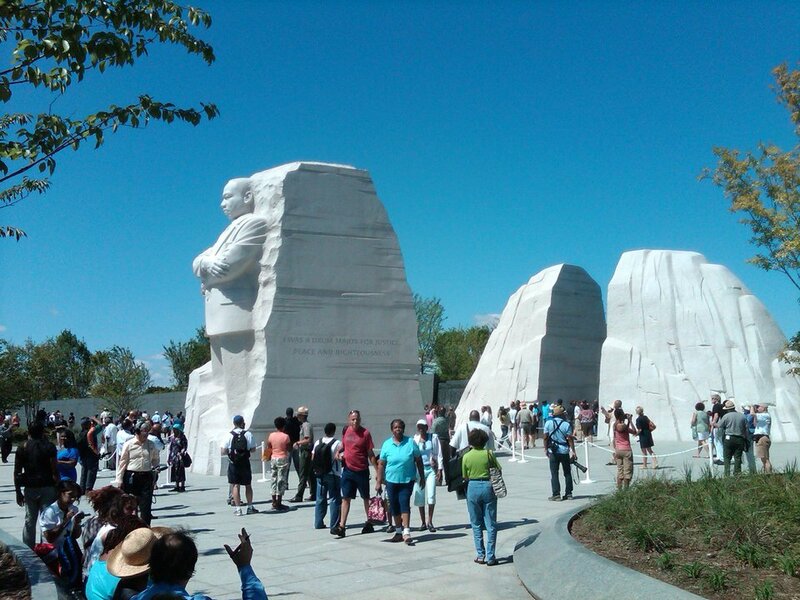 A dedication ceremony for the memorial was originally scheduled for later that same week, and had the ceremony taken place it would have coincided with the 48th anniversary of the “I Have a Dream” speech that King delivered on August 28, 1963, from the steps of The Lincoln Memorial. Unfortunately, the dedication ceremony could not be held because of Hurricane Irene, and was rescheduled for later that fall. 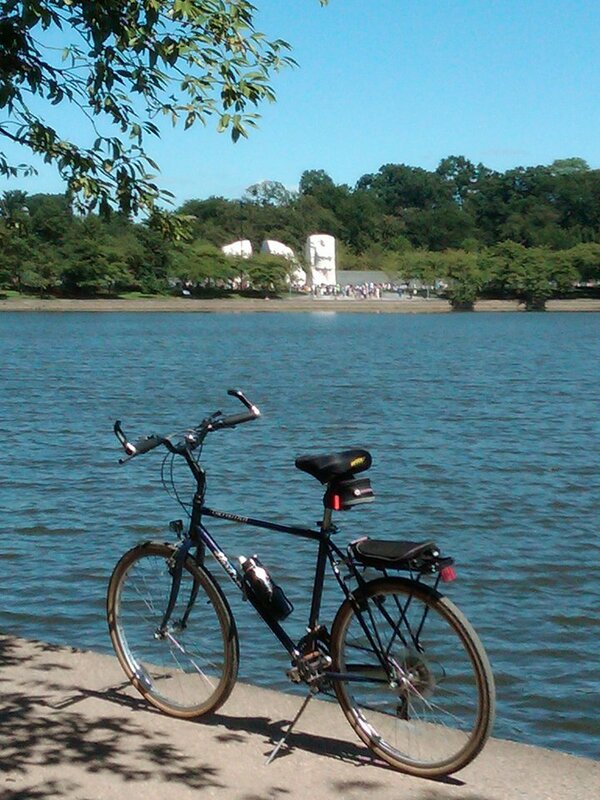 The memorial is located on a four-acre plot of land in southwest D.C.’s West Potomac Park, and is situated on one of the most prestigious sites that was remaining near the National Mall, at the northwest corner of the Tidal Basin near The Franklin Delano Roosevelt Memorial. 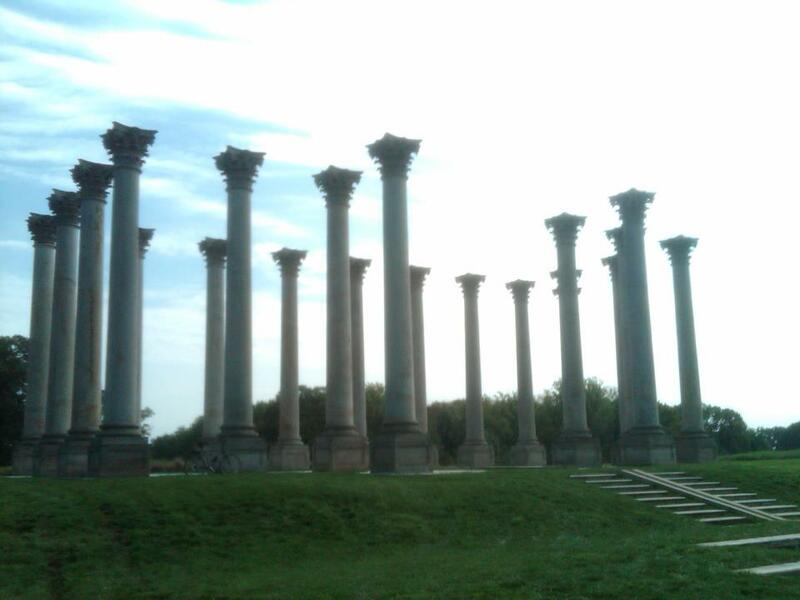 It is situated on a sightline linking The Lincoln Memorial to the northwest and The Jefferson Memorial to the southeast. The official address of the monument is 1964 Independence Avenue (MAP), an address specifically assigned to symbolically commemorate the year the Civil Rights Act of 1964 became law. 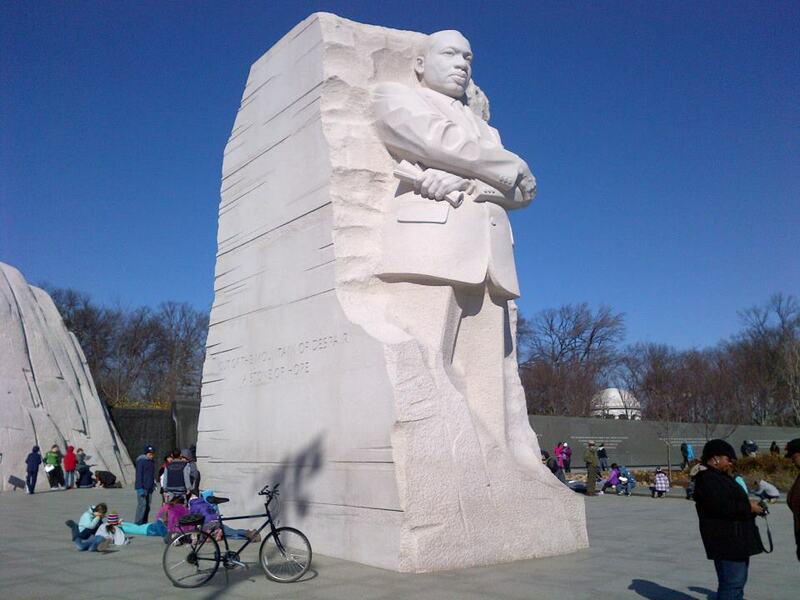 The large centerpiece of the multi-faceted memorial is based on a soul-stirring line from King’s “I Have a Dream” speech: “Out of a mountain of despair, a stone of hope.” The “Stone of Hope” is a 30-foot statue of a standing King, who is depicted with his arms folded in front of him, gazing over the Tidal Basin toward the horizon. The sculpture was carved from 159 granite blocks that were assembled to appear as one singular piece. The Stone of Hope seems to have emerged from within a large boulder behind it, representing the “Mountain of Despair,” which has been split in half as it gives way to the Stone of Hope. The memorial also includes a 450-foot crescent-shaped inscription wall, made from granite panels, that is inscribed with 14 excerpts of King’s sermons and public addresses to serve as living testaments of his vision of America. The earliest inscription is from the time of the 1955 Montgomery Bus Boycott in Alabama, and the latest is taken from his final sermon, delivered in D.C.’s National Cathedral just four days before his assassination in 1968. Landscape elements of the Memorial include American elm trees, Yoshino cherry trees, liriope plants, English yew, jasmine and sumac. And at the entrance to the Memorial, there are a bookstore and National Park Service ranger station which includes a gift shop, audio visual displays, touch-screen kiosks and more. 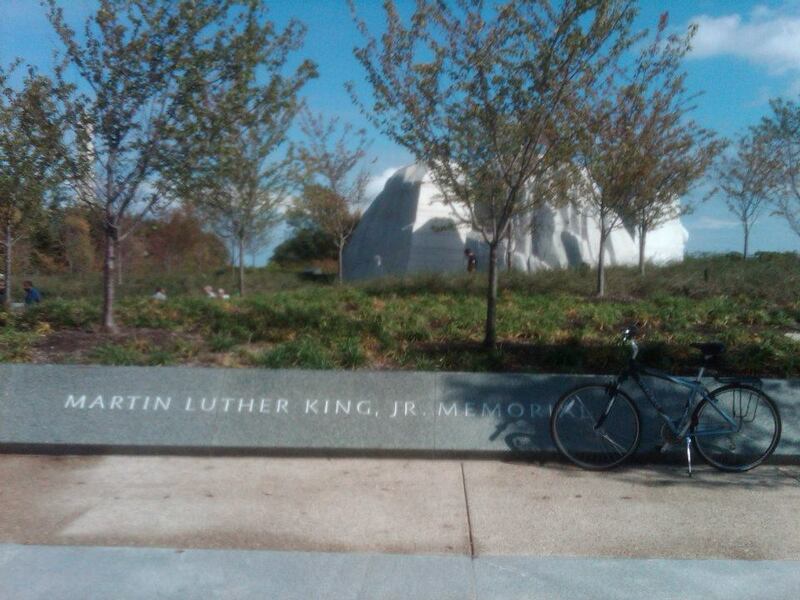 Like most other memorials, monuments, statues, and just about everything else in D.C., The Martin Luther King, Jr. Memorial is not without controversy. 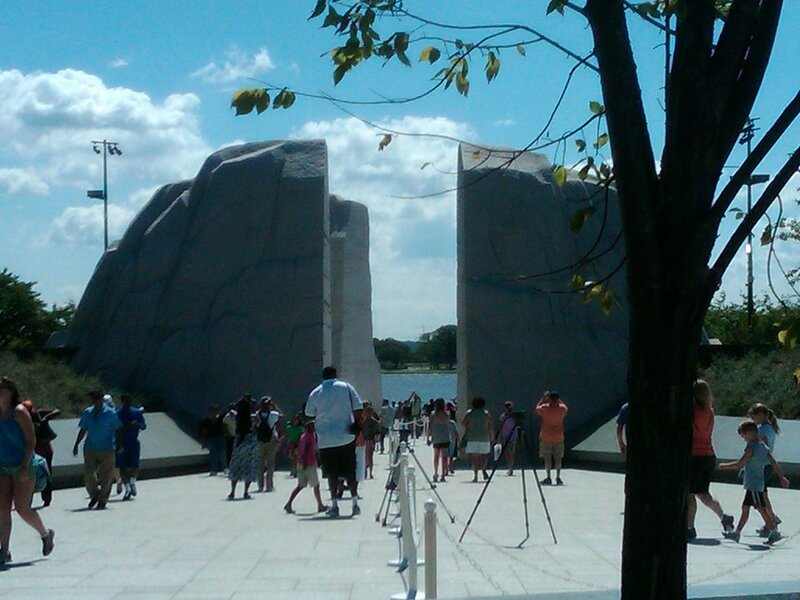 In fact, the memorial has been involved in or at the center of a couple of controversies. One controversy had to do with an inscription found on the Stone of Hope. Each side includes a statement attributed to King. The first reads “Out of the Mountain of Despair, a Stone of Hope,” the quotation that serves as the basis for the monument’s design. 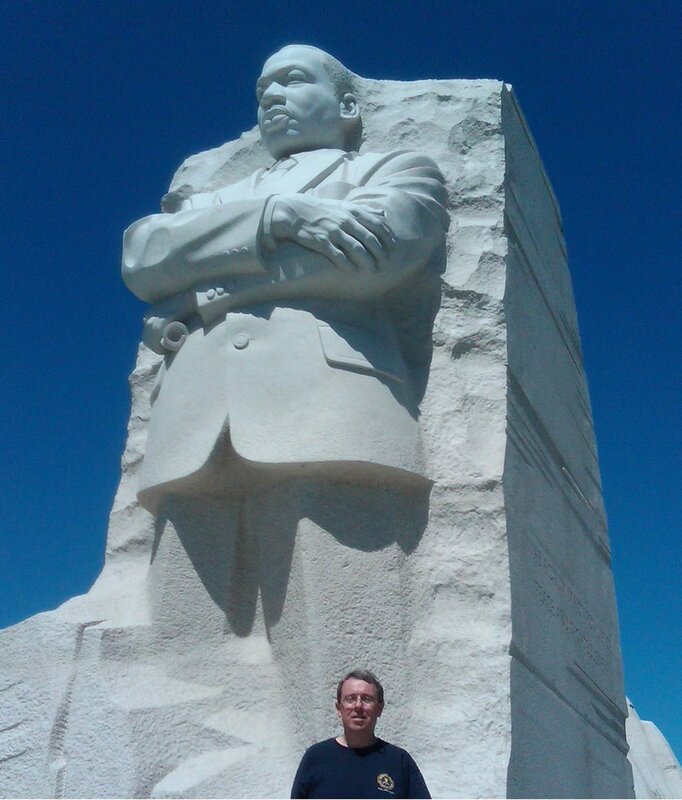 The words on the other side of the stone used to read, “I Was a Drum Major for Justice, Peace, and Righteousness.” On first reading, it seems an odd choice considering the phrase “I have a dream” is found nowhere on the monument. 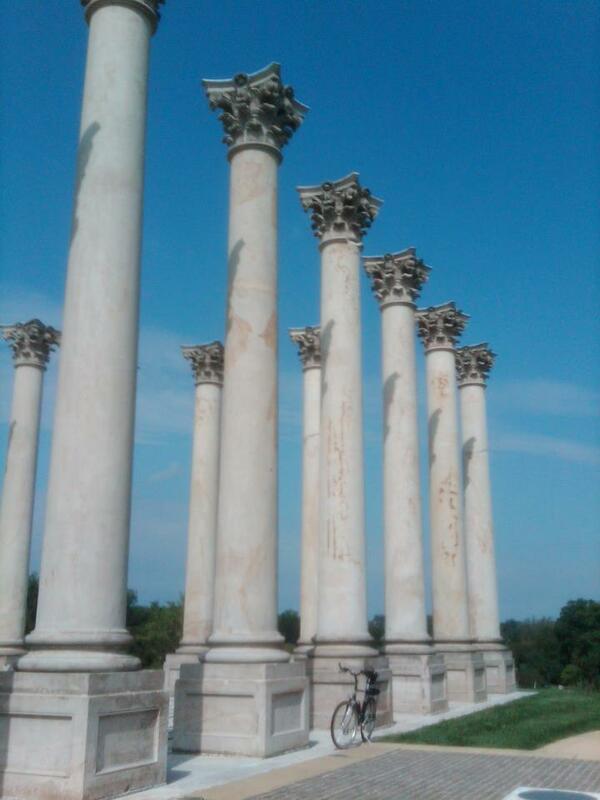 The drum major quote, as it was inscribed on the monument, is a paraphrased version of a longer quote by King: “If you want to say that I was a drum major, say that I was a drum major for justice. Say that I was a drum major for peace. I was a drum major for righteousness. And all of the other shallow things will not matter.” The memorial’s use of the paraphrased version of the quote was heavily criticized as turning a conditional statement into a boast, which was in direct opposition to the meaning of his sermon about the evils of self-promotion from which the quote is taken. Among the most vocal about this quote was the poet, Maya Angelou, who knew King, and said that the misquote makes King look like an “arrogant twit” and called for it to be changed, at whatever the cost. The inscription was removed in August of last year. 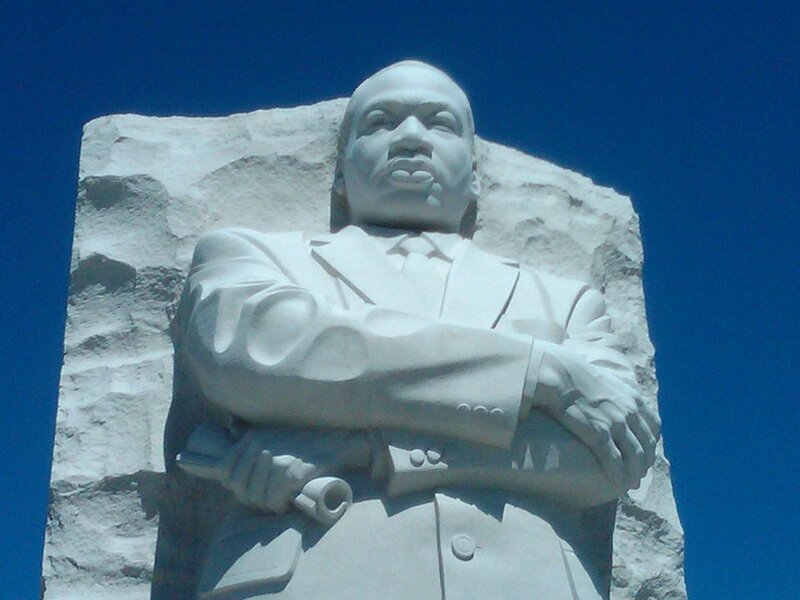 The other controversy has to do with the King family demanding that “The Washington, D.C. Martin Luther King, Jr. National Memorial Project Foundation,” which oversees the memorial, pay licensing fees to use King’s name and likeness. The issue of the fee originally delayed the building of the memorial. The memorial’s foundation, beset by delays and a languid pace of donations, stated at the time that “the last thing it needs is to pay an onerous fee to the King family.” And historian David Garrow, who won a Pulitzer Prize for his biography of King, said, “One would think any family would be so thrilled to have their forefather celebrated and memorialized in D.C. that it would never dawn on them to ask for a penny.” He added that King would have been “absolutely scandalized by the profiteering behavior of his children.” In response to the criticism, the family pledged that any money derived from the memorial foundation would go back to the King Center’s charitable efforts. Eventually, an agreement was reached in which the foundation has paid various fees to the King family, including a management fee of $71,700 back in 2003. Additionally, in 2009, the Associated Press revealed that the King family had negotiated a $761,160 licensing deal with the foundation for the use of King’s words and image in fundraising materials for the memorial. 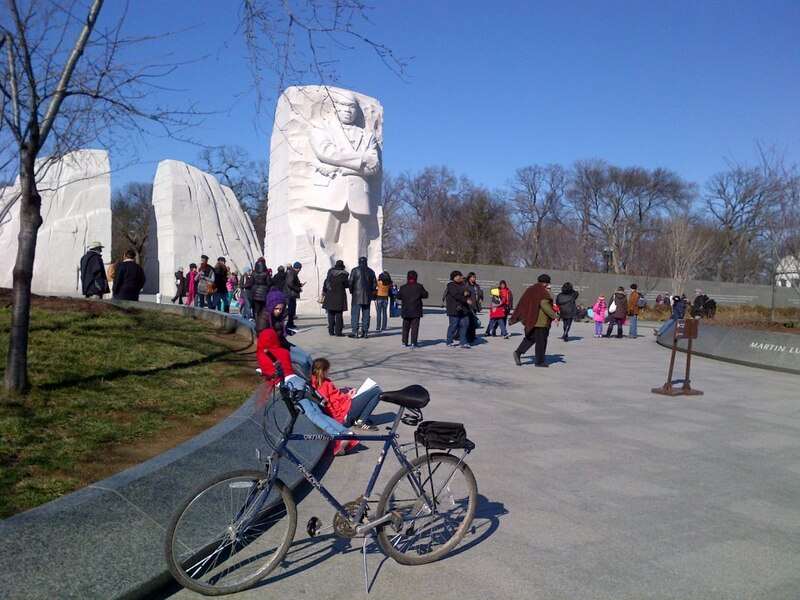 However, the controversies do not diminish the importance of the Martin Luther King, Jr. Memorial, and it remains a lasting tribute to King’s legacy and serves as a monument to the freedom, opportunity and justice for which he stood. 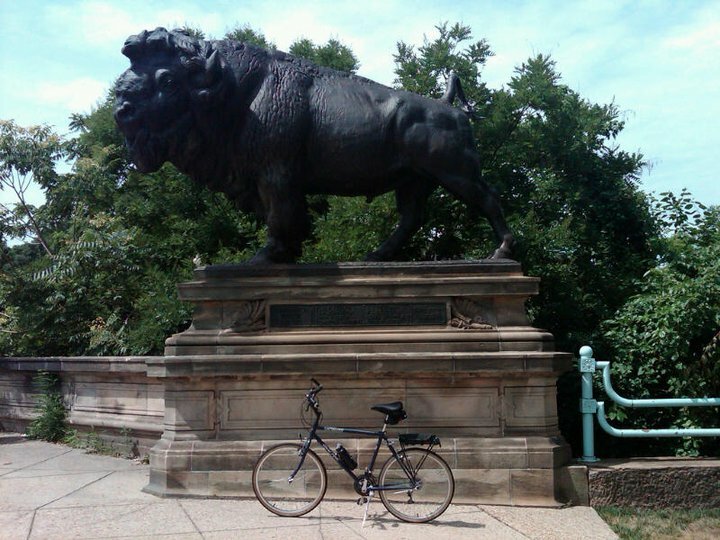 On today’s anniversary of his death in 1803 at the age of 58, I chose to write about my bike ride to Franklin Square, at 14th Street and K Street in northwest D.C., (MAP) to see the local monument commemorating Commodore John Barry. The monument consists of a statute of Barry standing on top of a base of pink marble with steps of pink granite. The base is adorned by the carved figure of a woman standing on the bow of a ship, with her raised right hand holding out an olive branch. Her lowered left hand holds a shield and sword steady at her side. To her right, an eagle standing on a branch of oak leaves gazes up at her. The bronze statue by American sculpture John Boyle is near the western border of the square. It was dedicated on May 16, 1914, and is part of a group of fourteen statues in D.C. known collectively as the “American Revolution Statuary.” These statues are scattered across the city, mainly in squares and traffic circles, and are listed as a group on the National Register of Historic Places. 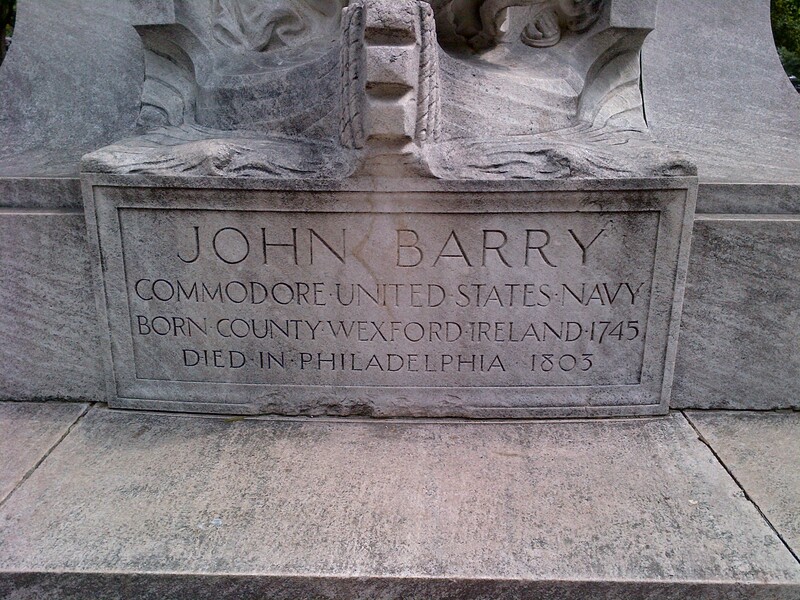 The Commodore John Barry Statue is not the only attraction in D.C. with a connection to Barry. The USS Barry Museum Ship, which currently lies moored at Pier 2 in the Anacostia River at The Washington Navy Yard (MAP), was also named after Barry. It is one of four Navy vessels which were named for the commander. John Barry was born on March 25, 1745, at Ballysampson on Our Lady’s Island, which is part of Tacumshin Parish in County Wexford, Ireland. The place of his birth had two very strong influences on his life. First, Wexford, at the southeasternmost part of Ireland, has always had a strong maritime tradition. And this tradition was instilled in Barry. Also, Barry learned at a very young age of the massacre of some 3,000 Wexfordians under an invading English force led by Oliver Cromwell in 1649, which led to a lifelong opposition to both oppression in general and the British in particular. Barry presented an imposing and commanding figure. He was a burly and in shape man of 6’4″, with a ruddy-complexion who spoke in a commanding tone. In an era when most men stood only about 5’5″, Barry’s physical presence served him well throughout a career which took him from humble cabin boy to senior commander of the entire United States fleet after becoming America’s first commissioned naval officer, at the rank of Commodore, receiving his commission from President George Washington in 1797. 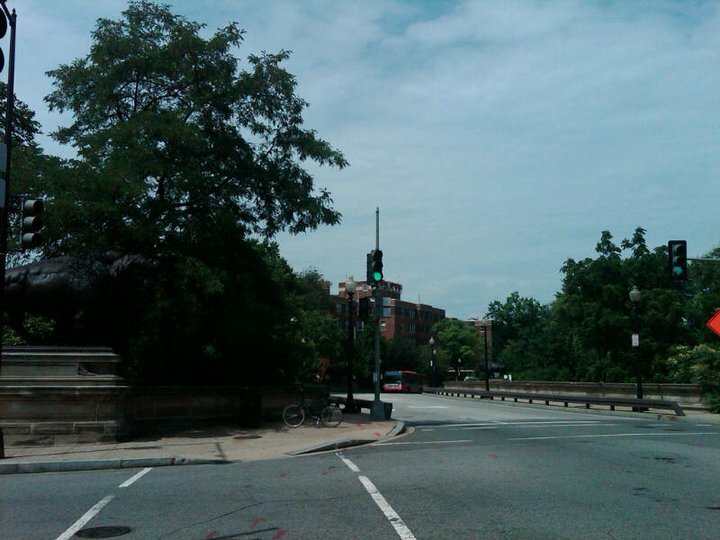 The Dumbarton Bridge, also sometimes referred to as the Buffalo Bridge or the Q Street Bridge, is an historic curved masonry arch bridge in northwest D.C., which conveys Q Street (MAP) across Rock Creek Park connecting the city’s DuPont Circle and Georgetown neighborhoods. The ornate neoclassical bridge with strong influences from Roman aqueducts was designed by Glenn Brown, with engineering design by Daniel B. Luten. It was added to the National Register of Historic Places in 1973. What most likely would have been a plain and practical bridge had it been constructed during any other era, the Dumbarton Bridge was built in 1914-15 and influenced by what is known as the “City Beautiful Movement.” This reform philosophy of North American architecture and urban planning flourished during the 1890s and early 1900s, particularly in D.C., with the intent of introducing beautification and monumental grandeur in American cities. However, its goal was not just to promote beauty for its own sake, but also to instill moral and civic virtue among urban populations. 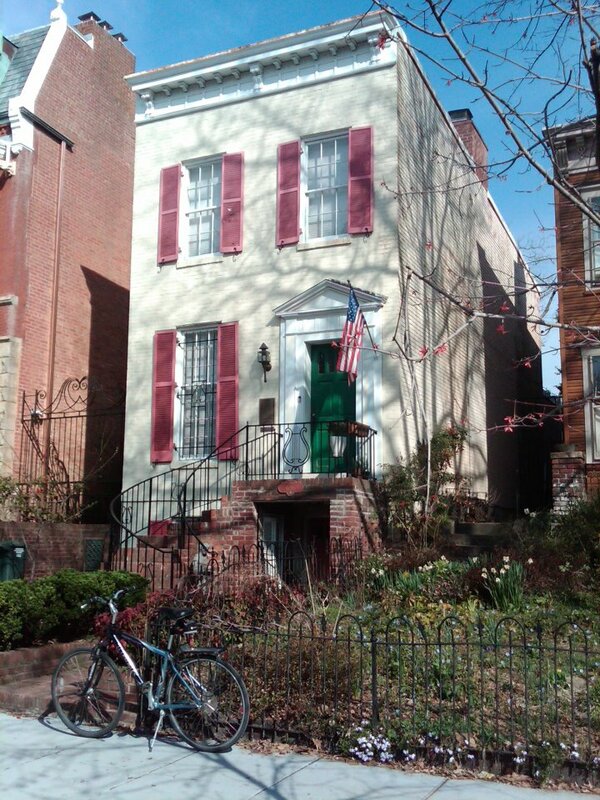 To accommodate the bridge’s approach and to keep the street continuous within Georgetown, the Dumbarton House, which at that time was known as Bellevue, was moved about 100 feet northward from its original site in the middle of the current Q Street to its present position on the north side of the street. However, the location of Dumbarton House was not the only construction problem facing the bridge. 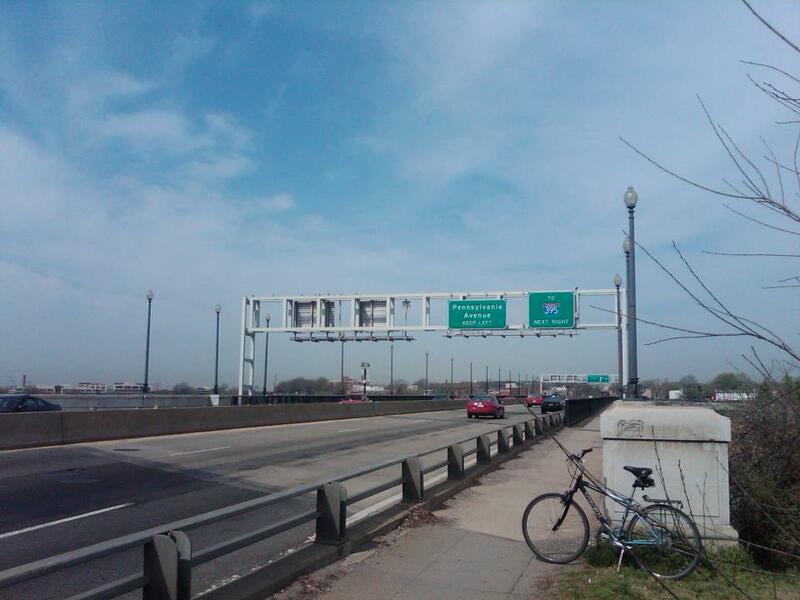 The proposed sections of Q Street, on either side of the bridge, were not aligned. This necessitated what turned out to be one of the bridge’s most unusual aesthetic features, its unusual curved design. The bridge is most widely known because of its four buffalo sculptures, which are located on the sides of both ends of the bridge, and appear to be sentries standing guard. 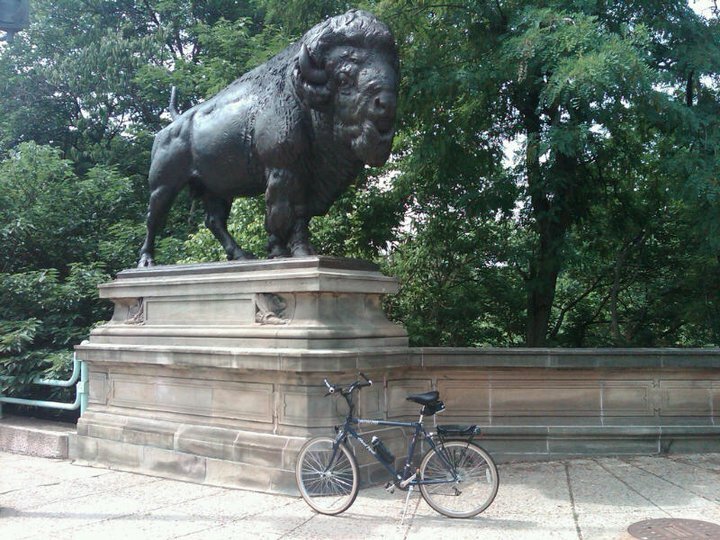 The buffalo were designed by American sculptor Phimister Proctor, who also designed the lion sculptures on the nearby Taft Bridge on Connecticut Avenue, and the tigers on the Piney Branch Parkway Bridge on 16th Street. 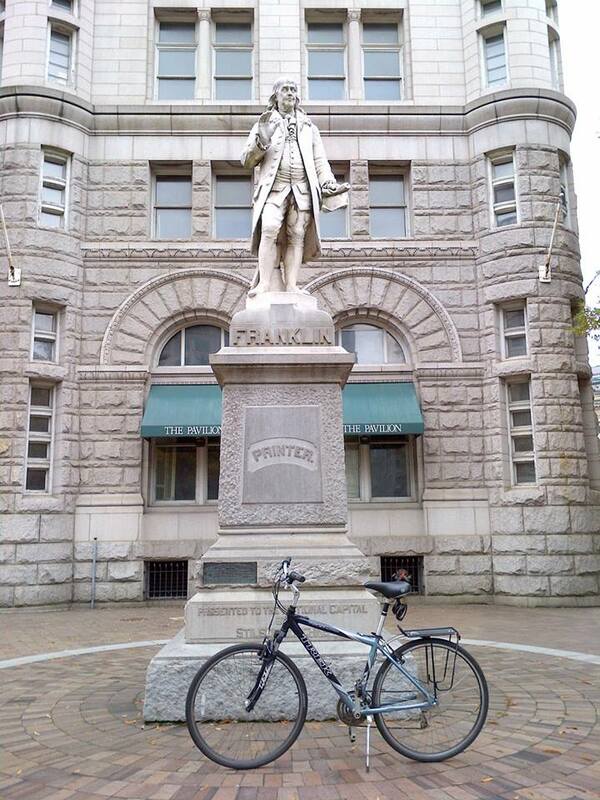 On this bike ride I stopped by The Old Post Office Pavilion, to see a statue of Benjamin Franklin. The statue, which was designed by Ernst Plassman and sculpted by American artist Jacques Jouvenal, stands on a pedestal in front of the building located at the southeast corner of the intersection of 12th Street and Pennsylvania Avenue (MAP) in the downtown section of northwest D.C. 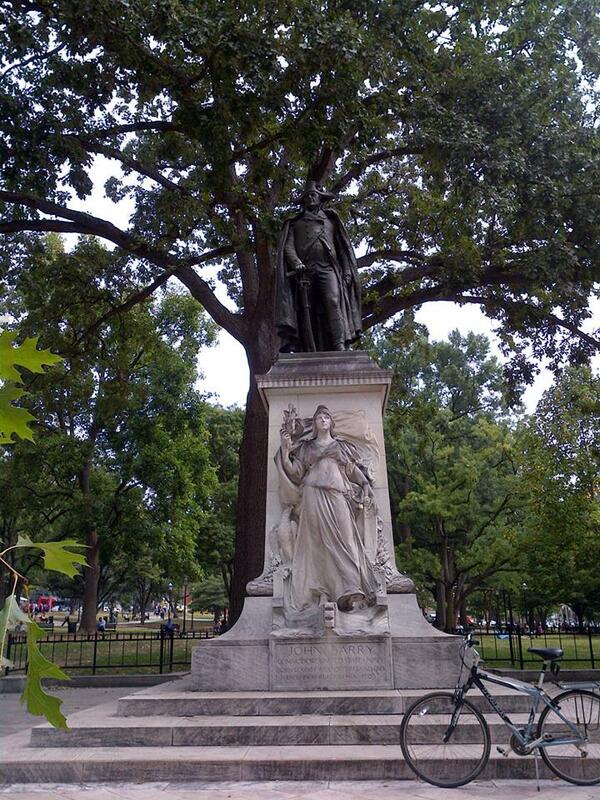 The Carrara marble statue was a gift of Stilson Hutchins, one of the founders of The Washington Post newspaper, and was dedicated on January 17, 1889, at 10th Street and Pennsylvania Avenue. It was eventually moved to its current site in 1982. The statue is part of group of fourteen statues called “American Revolution Statuary.” The statues are scattered across the city, mainly in squares and traffic circles, and are listed as a group on the National Register of Historic Places. Franklin was born in 1706 in Boston, the 10th of 17 children of soap maker Josiah Franklin, and his second wife, Abiah Folger. His father wanted him to attend school with the clergy, but he was unable to afford more than two years. Instead, Franklin attended the Boston Latin School, but dropped out at the age of ten. Although he never returned to formal schooling, Franklin continued his education through voracious reading, teaching himself to read French, Spanish, Latin, German and Italian. Later in life, however, he received honorary degrees from Harvard, Yale, the University of St. Andrews, the University of Oxford, and the University of Edinburgh. After leaving school, Franklin became an apprentice to one of his brothers, James, who was a printer. Thus began a career which would include varying levels of success in multiple vocations and avocations. Eventually becoming one of the foremost of this country’s Founding Fathers, Franklin was one of five men who helped draft the Declaration of Independence and was one of its signers. As a diplomat, he represented the newly emerging United States in France during the American Revolution. He was also a delegate to the Constitutional Convention. Franklin was also a patriot, statesman, political theorist, and politician, as well as an author, printer, librarian, bookstore owner, scientist, inventor, composer and musician, soldier in the Philadelphia militia, volunteer firefighter, philosopher, abolitionist, and civic activist. An authentic and world-renowned polymath in the vein of Leonardo da Vinci, Michelangelo, Galileo Galilei, and Nicolaus Copernicus, Franklin’s expertise spanned so many different subject areas that it is almost impossible to capture an accurate appreciation of his complexity and genius. In addition to his many more well-known accomplishments, Franklin was also instrumental in founding the first hospital in America; establishing the colonies’ first circulation library, founding the University of Pennsylvania, and organizing the first insurance company in the colonies. And as a prolific inventor, Franklin invented the rocking chair, the concept of Daylight Savings Time, the odometer, the Pennsylvania fireplace which is now more commonly known as the “Franklin Stove,” the flexible urinary catheter, the lightning rod, swimming fins, writing chair school desks, a new kind of ship’s anchor, a musical instrument known as a glass armonica, bifocal eyeglasses, and a pulley system that enabled him to lock and unlock his bedroom door without getting out of his bed. Other interesting albeit unrelated facts about Franklin include that at the age of 16, after reading a book about vegetable diets, he decided to become a vegetarian. He wrote the first known “pro vs. con” list as a method for contemplating and making a decision. Franklin thought the turkey should be the national bird, rather than the bald eagle, because he thought the turkey was more respectable than eagles and a true native of the United States. Also, while working in London, he was given the nickname “Water-American” because he would rather drink water than beer, unlike the vast majority of people at that time. Lastly, Franklin liked to take “air baths,” in which he would sit naked in his bathtub and let the cold air from an open window clean away germs. Oddly, Franklin also had two birthdays during his lifetime. His birth certificate reads that he was born on January 6, 1706. However, in 1752, the British colonies changed to a different calendar. Over time, calendars no longer line up with seasons and adjustments must be made to help synchronize the calendar year with the solar year so that seasons happen in the right month. That is why we now have leap year. Anyway, at midnight on September 2, 1752, it legally became September 14th, and previous dates were adjusted for the new calendar. Franklin’s new birthday from that point forward became January 17th. Franklin was also a postmaster, having been appointed the British postmaster for the colonies by King George III before the Revolutionary War. Then on July 26, 1775, the Second Continental Congress established The United States Post Office and named Benjamin Franklin as the first U.S. Postmaster General. 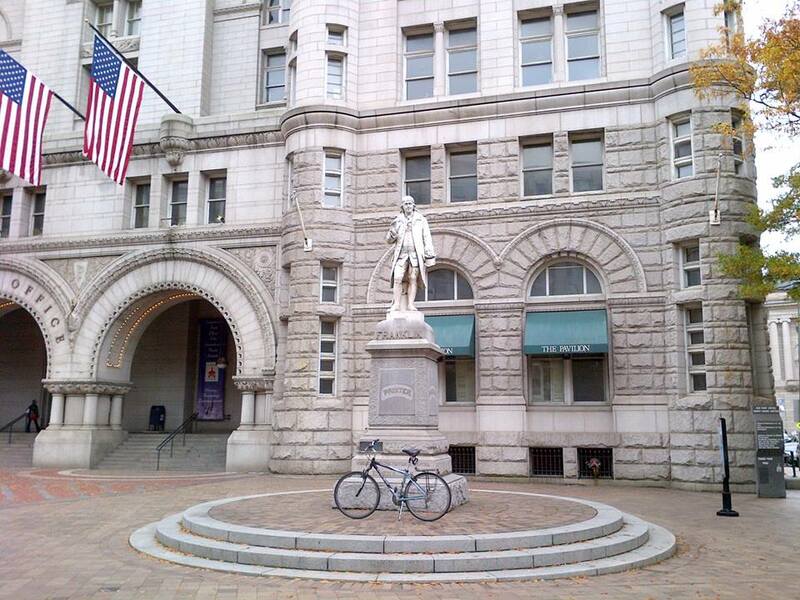 This may explain why the statue was placed in its current location in front of the Old Post Office building.